Nearly a month on from their last face to face talks on the Scotland Bill, the Scottish Secretary has said that he hopes the First Minister will use this week’s meetings with the UK Government to supply real and substantial detail on its proposed changes it is seeking for the Scotland Bill. Michael Moore said that the Prime Minister, Deputy Prime Minister and himself were all meeting with Mr Salmond this week and that could only giver proper consideration to serious proposals, properly thought through. The Prime Minister is chairing the Joint Ministerial Committee in London tomorrow and the Deputy Prime Minister will be in Scotland on Thursday where he will meet the First Minister. 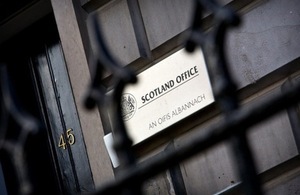 In their talks in Edinburgh last month the First Minister agreed to provide the Scottish Secretary with a detailed submission to support the Scottish Government’s call for devolving extra borrowing powers, Corporation Tax and the Crown Estate. No submission has been received but the First Minister has since indicated that he also wants to see broadcasting, excise and European Council representation devolved to Holyrood. The Prime Minister had a telephone conversation with Mr Salmond straight after the Scottish elections and both the Chancellor and the Deputy Prime Minister have also met the First Minister in the past few weeks.